Passing up the chance to veto the bill in favor of stopping Monsanto’s increasing monopoly on the food supply, Obama pushed the bill through into a law in a move that reminds us of his failed 2007 promise to ‘immediately’ label GMOs upon his election. Contained in the rider (Farmer Assurance Provision, Sec. 735) of HR 933, Monsanto is now even protected (at least under this law) from the United States government. As I pointed out in a previous article, the Monsanto Protection Act’s success actually proves how corporations have more power than even the United States federal government. Monsanto’s lobbyists managed to slip the rider into the major bill, which — despite the rider — has virtually nothing to do with the topic. This is a typical and routinely practiced move by lobbyists to insert an incognito line of legislation into a bill generally viewed as favorable overall. One that has proven to be effective for Monsanto. 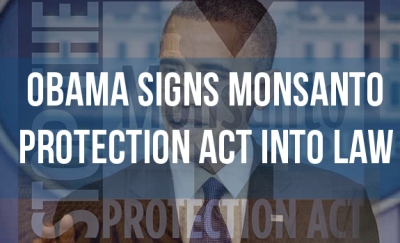 The result is now major outcry against Obama for signing the bill into law and protecting the biotech juggernaut Monsanto. Many fail to remember, however, that Obama first decided to allow Monsanto to continue pulverizing the food supply and the health of the nation back in 2008 when he went back on his promise to ‘immediately’ label GMOs. It was in 2007, during a campaign speech, that Obama first stated his support of non-GMO and GMO labeling activists, in which he promised to swiftly label GMOs. For a brief period before the bill was passed by the Senate and now signed into law by Obama, both myself and many others in the alternative news community crusaded tirelessly to alert politicians and activists in order to stop the Protection Act from going through. Unfortunately, time was not on our side. The hasty vote by the Senate and the news blackout from the mainstream media were enough to break through the warnings of concerned activists (and people who just want real food). Now, however, renewed interest in the GMO labeling campaign and the fight against Monsanto brews. With such a blatant and cocky act against the United States and its people, Monsanto has set itself up to fail. Let’s remind Obama of his promise to label GMOs he made many years ago.